No other family sedan can beat the Camry's driving comfort. The V6 Camry is one of the fastest in its class. Safety ratings are among the best too. The Camry has front-wheel drive and comes with a 4-cylinder or V6 engine. Both engines offer good fuel economy. Toyota Camry holds its value well and is easy to sell. Are there any drawbacks? What are the reported problems? In the US, the Camry is available in base L, popular LE, sporty SE and top-of-the-line XLE trim levels. In Canada, the lineup consists of LE, SE and XLE. Common problems: According to the service bulletin T-SB-0041-13, the brief knock/rattle at cold stratup in the 2012 Camry 4-cylinder 2AR engine could be caused a problem with Camshaft Timing Gear Assembly. To repair the problem, the gear assembly must be replaced. Another bulletin T-SB-0086-12 describes the intermittent shudder on light acceleration after an upshift in some 4-cylinder 2012 Camry vehicles. The bulletin instructs replacing a torque converter if the issue is not resolved after changing the automatic transmission fluid. Toyota USA issued Warranty Enhancement Program – ZE5 for certain 2012-2014 Camry for U760E Torque Converter Shudder. Several Camry owners mentioned a musty smell right after the A/C is turned on. Toyota issued the service bulletin T-SB-0142-13 describing the ways to minimize the odors. Recommendations include: set the HVAC system to "fresh" air mode when parking the vehicle, replace the HVAC filter (cabin filter) annually or every 10,000 miles. Use the High Performance Charcoal Filter. Do the A/C evaporator cleaning service once a year if the condition persists. Read more about cabin filter. Several owners complain about power sunroof/moonroof switch not working intermittently in the 2012 Camry. We found the bulletin T-SB-0116-14 on this issue. The TSB recommends checking the switch and if defective replacing the overhead console assembly with an updated part. The part is sold for around $100 online. 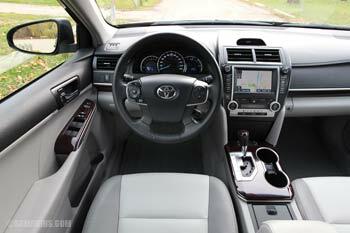 Fuel economy: The EPA rates the 2012 Toyota Camry with a 4-cylinder engine at 24/34 mpg or 9.8/6.9 L/100km city/highway. That means you can drive up 476 miles (766 km) on a tank of gas. The 2012 Camry with a V6 gets 21/30 mpg or 11.2/7.8 L/100km; it can go for 408 miles or 657 km on one tank. Toyota Camry 4-cylinder 2AR-FE engine. 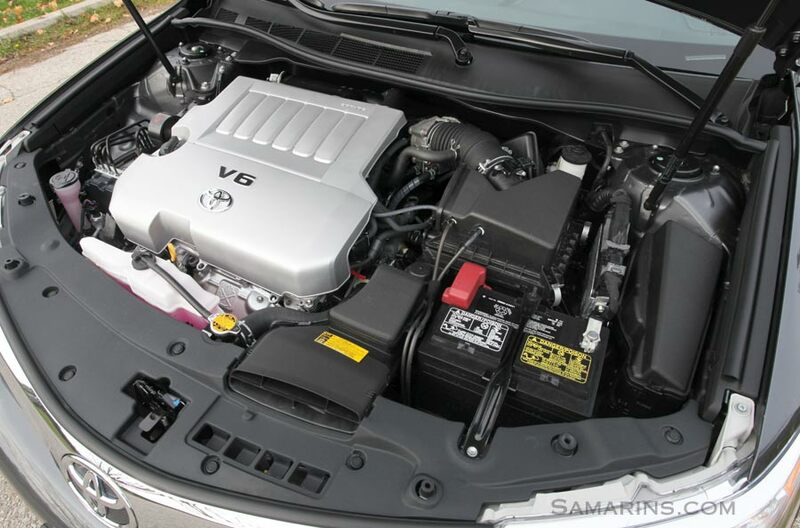 2012 Toyota Camry V6 2GR-FE engine. Engines: Both the 2.5L 4-cylinder (2AR-FE) and the 3.5L V6 (2GR-FE) are twin-cam engines with variable valve timing. Either can run on regular gasoline. Toyota has used both of these engines for several years in many markets and they both have proven to be reliable. Timing belt or timing chain: Both the 2.5L 4-cylinder and 3.5L V6 have a timing chain; there is no timing belt. A timing chain does not require regular replacement. Mechanical: The only available transmission in non-hybrid models is a conventional 6-speed automatic. The steering is electrically assisted. The suspension design is similar to the previous models, with MacPherson struts on all four wheels. Rear brakes are discs only. 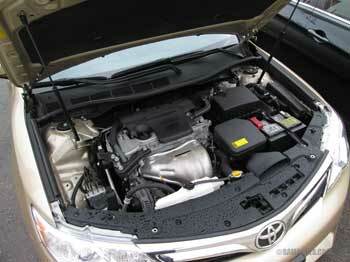 The Camry Hybrid is powered by the 2.5-liter 4-cylinder engine combined with the 105-kW electric motor. A powerful hybrid battery pack installed under the trunk floor stores the electric power. 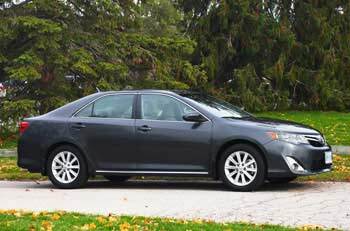 The 2012 Camry Hybrid LE gets 40 mpg (5.7 L/100 km) combined. Handling and ride: Driving the Camry is a pure pleasure: it's soft, quiet and smooth. Road bumps and imperfections are well insulated. Compared to the previous model, this Camry handles better and feels more stable in turns. The steering is light, and the turning radius is pretty good; the only downside is that it feels a bit numb around the center position. The 3.5L V6 is actually crazy fast; the Car and Driver magazine clocked the 2012 V6 Camry accelerating from 0 to 60 mph in 5.8 seconds. This is a sports-car territory; think the C4 Corvette or 4-th Gen Ford Mustang GT. Safety: Stability control, traction control, antilock brakes, as well as 10 airbags are standard in all Camry models. The 2012-2014 Camry got the perfect 5-star overall rating in government crash tests. The Insurance Institute for Highway Safety (IIHS) presented the 2012 Camry with the "Top Safety Pick" award. Interior: The interior is practical and stylish. Large doors and elevated seats make entry and exit easy. The USB and Bluetooth are standard. Front seats are supportive. Visibility is good, thanks to tall windows. The JBL audio system (available in the XLE trim) sounds excellent. refined powertrain, very powerful V6; interior room and comfort, resale value, moderate ownership costs. Cons: Pass-through behind the rear seats is fairly small, glove box is not very large, some of the interior materials could be better, the steering feels a bit numb around the center. Overall: The Camry is still the most comfortable, easy to drive family sedan on the market. It's also very reliable: Consumer Reports ranks Toyota Camry very well, the 2012 and 2013 models are rated "Above average" for reliability and listed as 'Recommended.' J.D. Power and Associates gave the 2012 Camry four out of five stars for predicted reliability. Owner reviews: Several 2012 Camry owners mentioned vague steering feel on the highway. A few other complained about the smaller and harder front seats. A number of owners mentioned that they can get the advertised fuel economy numbers. Overall, however, most Camry owners are happy with their cars. 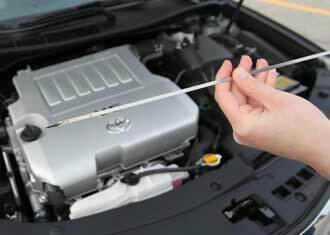 Maintenance tips: In the Warranty and Maintenance Guide for the US 2012 Camry, Toyota recommends changing engine oil every 10,000 miles/12 months with 0W-20 synthetic, when driving in normal conditions. When the vehicle is driven under especially demanding conditions, including low temperatures, extensive idling, etc., the recommended oil change interval is every 5,000 miles/6 months. Of course, you know that your engine will last longer if you change your oil more often. Toyota recommends rotating tires every 5,000 miles, so if you take your car to a dealer every 5,000 miles for tire rotation, why not do the oil change at the same time? It's also important to check your oil level regularly, as some amount of oil is consumed as you drive and you don't want your engine to run low on oil. According to the owner's manual, the 4-cylinder 2.5L engine uses a high-strength drive belt; make sure to use the right part when replacing it. The maintenance schedule is online at the Toyota Owners website. An owner's manual can be accessed at the same website.